1920's glam has never looked so fabulous, with the quick release of The Great Gatsby on Blu Ray and DVD on August 27, many of us movie and fashion lovers are escaping our mundane, busy lives by indulging in this fabulous period piece. 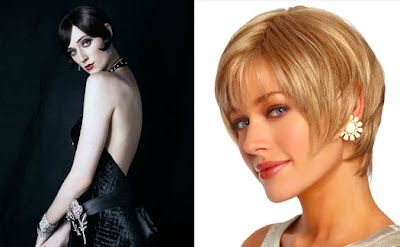 So why not fully escape into the world of Gatsby's and pamper ourselves with new wigs to recreate one of the fun and unique looks of the women in The Great Gatsby. 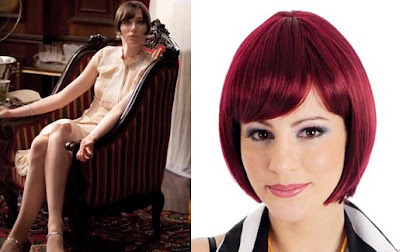 Whether your an early bird who's planning her costume for Halloween, a bold fashionista who isn't afraid to show her 1920's alter-ego, or simply a mom who enjoys playing dress-up with her girls, WigSalon.com has the perfect wigs for you that will transform you into a 1920's beauty queen at very affordable prices. 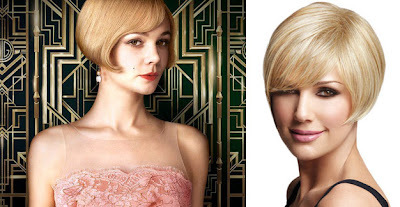 If you're going for a natural beauty, sassy, and feminine look, then look no further because Daisy, the femme fetale of The Great Gatsby has got it all. Asymmetric by LUXHAIR in Vanilla Lush (the wig featured above) perfectly captures the delicacy, and the decadency of Daisy's look with its lightly textured side swept bangs and clean tapered neckline. Get more of Daisy's styles by simply restyling the this Heat-friendly wig! For a sweet-heart effect, and an everyday style try Lauren in Coco Cream or any color of your preference. Relibious, edgy, and sleek are three adjectives that come to mind when pondering Jordan Baker famous Flapper style. 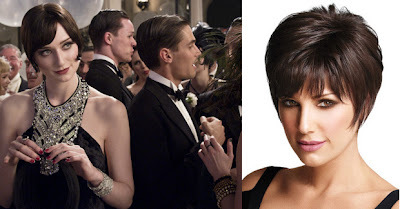 The self-assured aura of Ms. Baker can perfectly be captured with Perfection by Gabor Wigs in Black Coffee , a classic short bob with all-over-expertly tapered layering. Perfection adds confidence and independence to any look and you're guaranteed to be the talk pf the party. Modernize Jordan's edgy style and try Pixie in Black Brown; a pixie wig that feautures soft layers, razored edges, and lightly textured bangs. For an added shock effect, go for Bliss by Risque Wigs, a short layered bob with a full fringe in fun colors Purple or Deep Red.